Tragedy strikes the Ramon family again from the air. Lieutenant Asaf Ramon, son of Israeli astronaut Ilan Ramon, was killed Sunday when the F-16 fighter jet he was flying crashed over South Mount Hebron during a routine training exercise. Rescue forces found the remains of the fighter jet and Ramon's body in the surrounding area. Following his death, the Israel Defense Forces decided to promote Asaf to the rank of captain. Asaf Ramon will be laid to rest at 4 pm Monday at the Nahalal cemetery, next to his father. At 4:30 pm, Rona Ramon received the news she feared most. Her eldest son, Asaf, who recently completed the IAF's pilots' course, was killed in a training accident Sunday afternoon. Her son's dream to be a pilot like his late father, Ilan Ramon, the first Israeli astronaut, was cut short in circumstances horrifically similar to his father's death. Six years after his father's death when his space shuttle crashed as it returned to earth, Asaf Ramon met a similar fate. Israeli Air Force Commander Ido Nehushtan and IDF Personnel Directorate Chief Brigadier-General Avi Zamir delivered the sad news to Rona Ramon. Accompanying them was former IAF Commander Eliezer Shkedy. IDF Chief of Staff Gabi Ashkenazi and former Chief of Staff Dan Halutz arrived at the house as well. In the past hours, friends and family have flooded the family's home to offer comfort to the mourners. Classmates of Yiftach, Asaf's younger brother, gathered in a square next to the family's home. Their teacher reported that they are sitting and crying together in the square as they share memories of Asaf. Asaf Ramon left for a training flight with the fighter jet from Navatim Air Force Base in the afternoon hours. Around 14:00 reports of an aircraft "diving" to the ground near the town Pnei Hever south of Mount Hebron were received. Civilians reported that they heard an explosion and saw a mushroom cloud of smoke. The IAF looked into the reports. It quickly became clear that the F-16 that left for a training flight from Navatim Air Force Base went missing and that all communications with the aircraft were lost. Within a short time, the magnitude of the disaster became clear – the "Hawk" fighter jet crashed and the pilot was killed. Rescue and security forces had difficulty reaching the site of the crash because it occurred in a wadi with limited access ways. Ariel, a resident of Kirya Arba who arrived at the scene of the crash, told Ynet, "Many ambulances and military vehicles arrived. Nearly nothing was left of the plane." One of the rescue workers on the scene said, "We received reports from civilians on something falling from the sky. It was unclear whether it was a helicopter or a plane, something identified. We went to the site in cooperation with the military and the air force. We combed the scene of the crash together with the military medical team." Girls doing national service in the Maale Hever Seminary saw the mushroom cloud of smoke that resulted from the crash. "We were in the synagogue rehearsing for a play when we suddenly heard a large explosion. The ground shook. We looked out the window and saw a mushroom cloud of smoke. The entire caravan shook and after a few minutes there were many helicopters in the sky." Rescue and security forces searched the area for about an hour, covering a radius of about a kilometer (0.6 miles). "We found remains. There were many pieces of metal on the scene. Unfortunately, there already wasn't anything to do on the scene," said the rescue worker. 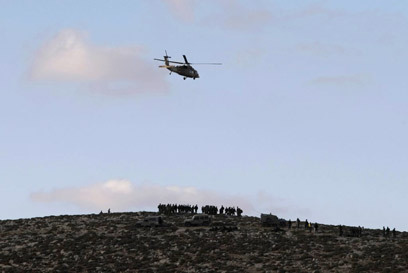 The IDF declared the scene of the crash a closed military zone. IAF helicopters flew above and military jeeps searched the area in an attempt to locate remains and additional plane parts. The plane Asaf Ramon was flying was the most veteran model of the F-16, used by the IAF since 1978, and is considered to be of reliable and high quality. The plane left the "Golden Eagle" Squadron for a basic, routine training flight typical for pilots at the beginning of their operational training once they have finished pilots' course. The IAF is investigating the circumstances of the accident. It still remains unclear whether it was caused by a technical malfunction or by human error. The IAF is also investigating why the pilot was unable to use the ejection seat to escape from the plane before it crashed. IAF Commander Ido Nehushtan appointed a commission of inquiry headed by a colonel to investigate the circumstances leading to the crash. In addition, according to formal protocol, all planes of this model will be grounded for the next 24 hours until technical malfunction is ruled out as a contributing factor. Chief of Staff Gabi Ashkenazi also arrived at the scene of the crash. Some six months ago, Asaf Ramon survived a crash in pilots' course caused by a rare and unusual malfunction of the plane he was flying. During one of the practice flights on a single-engine Skyhawk plane, the engine died. The instructor explained to Ramon how to manage the malfunction. Asaf acted according to the instructions he received and successfully landed the plane at Hatzerim Air Force Base. 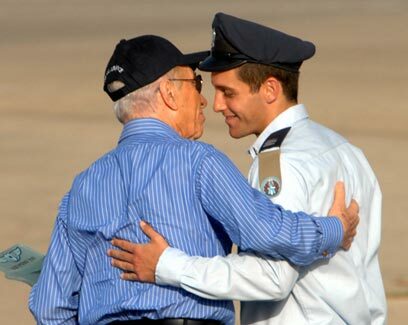 Asaf's father, Ilan Ramon, also completed the pilots' course with honors some 35 years ago. He achieved the rank of colonel and was chosen by NASA to become the first Israeli to fly into space. Ilan Ramon managed to make history, but the Colombia space shuttle he was in crashed as it returned to earth in 2003. Asaf was 15 when he lost his father. Even then, he announced his desire to follow in his path and become a pilot. See all talkbacks "Late astronaut's pilot son killed in crash"